He has been home for a whole month now but it only took about five minutes for the kids to become completely enamored with their Dad. 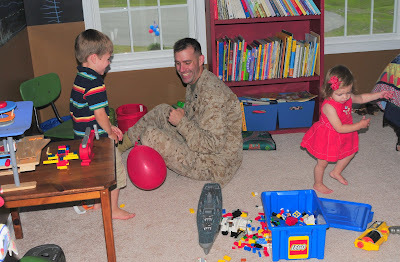 On that precious day in May, before he had even changed out of his dusty cammies and boots, he was on the floor surrounded by Legos, taking in all the newness and changes, giving horseback rides and kisses. Kenna’s face lights up daily at the site of him. “Datty!” she exclaims with a toothy smile. At bedtime, we have difficulty prying her little arms from around his neck. And my heart melted the day I heard Tristan say, “Hey Dad, let’s have some guy time!” I love to hear them all giggling together. I love the way he calls them his baby bears. I love that with dad, our kids will always know they are loved and safe and cherished. 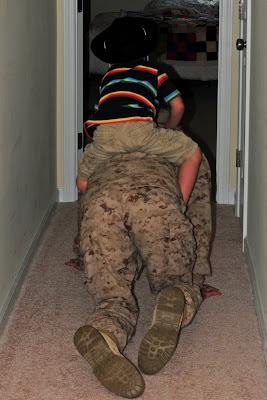 I love that we haven't felt a need to "adjust" to dad being home...life has simply gone back to normal. Our little world feels right once again. Yes, it’s good to have Dad home.